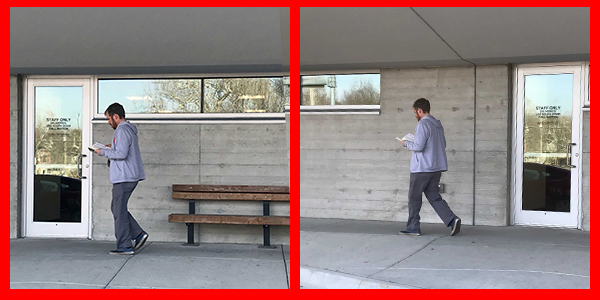 Each week, Gregor hits the road in the hard-to-miss, red and white book van to bring fresh books, movies, and music to retirement communities throughout Lawrence. In April, Pioneer Ridge (4851 Harvard Road) made the 10th stop along the book van's weekly route, and, beginning June 5, Bethel Estates (2140 E. 25th Terrace) will become the 11th site to receive the service. Caution: Only the highly skilled should ever attempt read-walking. Gregor is one of those kinds of readers who can't bear to tear himself away from a book. So much so, in fact, that he's learned the tricky art of read-walking. "It makes life so interesting when you read, because a book can take you anywhere in the world," he says. "It's my favorite pastime, after sleeping and eating." Pastimes aside, it's apparent that work life makes way for Gregor's passions, too. At each site, he brings items that people have placed on hold as well as a mini library containing books, movies, and music for general perusal. "I find that simply talking to people about their interests gives me some intuition for specific books or authors that will be popular for browsing," says Gregor. He cites James Patterson, Danielle Steele, and John Grisham as popular authors throughout the city, and romantic comedies as a trustworthy cinematic pick, but sometimes a genre-specific craze spreads through a community out of the blue. For instance, says Gregor, "Amish fiction got to be really popular at Meadowlark Estates." At the newest locations for the book van service, Bethel Estates and Pioneer Ridge, Kathleen Morgan, Director of Development and Community Partnerships, and Gregor held a Q&A session with residents to prep them for the upcoming arrival of library materials. "We always want to check in to make sure everyone is ready for the service to begin," Kathleen explains. "People are usually very excited about it." Gregor is soft-spoken and reserved, but when he gets up before a rather sizable assembly of residents, his crinkly-eyed smile is met with adoration and several of the residents wave to get his attention, calling him by name. He gets a roomful of laughs when he proclaims, "I take requests!" Among his fellow bibliophiles and devotees of the library, Gregor seems to have quite the fan following. 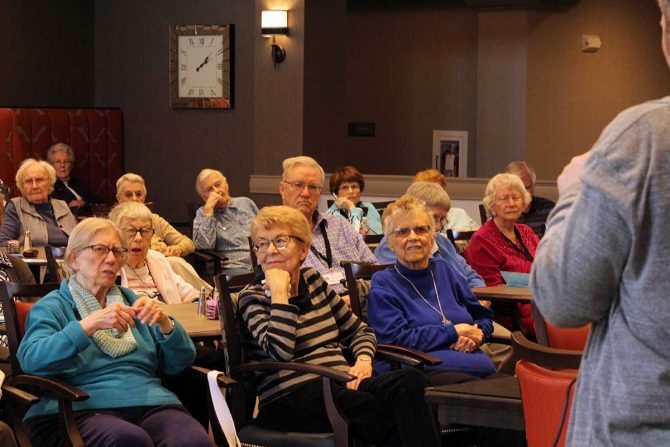 A group of residents at Pioneer Ridge listen as Gregor explains the finer points of the new materials delivery service that began there in April 2018. "When we walk into a place, it's like he's a god," laughs Kathleen. "It's because of the books," Gregor insists. "We're bringing books to the people, and without that they might not have access to the joy that reading brings. For some people, that's their lifeline." 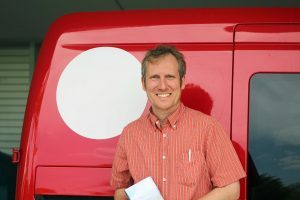 To find out more about the services Gregor can bring on the book van, including deliveries for homebound patrons, view the full schedule or get in touch with Kathleen or Gregor.